Ganga Sadan Haridwar is a Boutique hotel with 4 star Deluxe Room amenities, boasts of 14 Ganga facing & 4 non Ganga facing well designed rooms suiting the taste and needs of the guests. The hotel Ganga Sadan is nestled on the Ganges river with private bathing Ghat in Haridwar, it offers an ambiance of peace & tranquility with breathtaking views. Hotel Ganga Sadan is located just 1km before from Har-ki-pauri and 400 meters away from the Haridwar railway station. Distance from Ganga Sadan hotel to other nearby places are: City center (0.5 km), Har-ki-pauri (1 km), Railway Station (0.5 km), Bus Stand (0.5 km), Jolly Grant Airport (38 km), Rishikesh (30 km), Mussoorie (87 km). 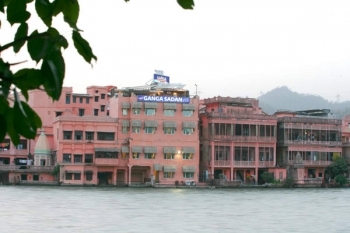 Ganga Sadan is a boutique hotel with private bathing ghat located on the bank of the River Ganges. 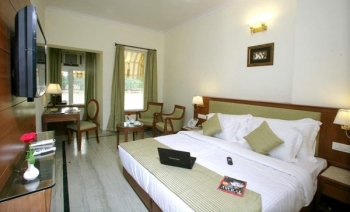 It offers accommodation in 14 Ganga facing Luxury & Premium Rooms and 5 Non - Ganga facing Superior & Executive Rooms. All the guest rooms are equipped with luxurious amenities and services, such as air-conditioners, LCD TV with satellite box, intercom and direct dial telephones, fruit basket, cookies platter, mineral water, daily newspaper, electronic safe, and tea and coffee maker. The rooms also offer snack basket, WiFi connectivity and mini bar (nonalcoholic) on a chargeable basis. The bathrooms attached to each & every room, with most modern fittings have shower area, toiletries and 24 hrs running hot and cold water. The hotel Ganga Sadan has a rooftop restaurant Vue that serves multi-cuisine vegetarian food by the riverside and also has an in-room dining option. The hotel has a massage Room, steam room, travel desk and the safe parking facility managed by the government. The hotel offers laundry service, airport and railway station transfers, Yoga classes, and taxi, guide and sightseeing services on request and on chargeable basis. - Complimentary foot Or head massage once during the stay for a couple. - Escorted visit to Har ki Pauri during Morning / Evening Aarti. By Rail: Haridwar is well connected by railway networks with major destinations of India. Haridwar has excellent rail network with all important cities of India. Trains to Haridwar run on regular basis. By Road: Haridwar is well connected with motorable roads. Luxury and normal Buses to Haridwar are available from ISBT Kashmiri Gate. Buses and Taxis to Haridwar are easily available from major destinations of Uttarakhand state. Haridwar is connected with National Highway 58. By Air: The nearest domestic airport is Jolly Grant Airport in Dehradun which is a located 35 km from Haridwar. Indira Gandhi International Airport in New Delhi is the nearest International Airport.